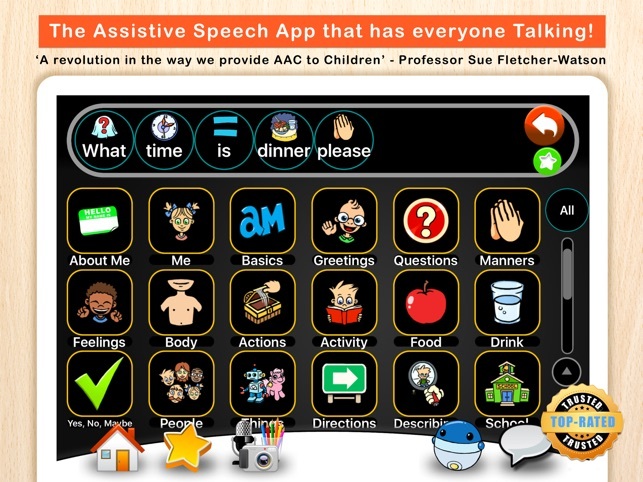 “aacorn AAC is a revolution in the way we provide assistive speech support to children.. The first to really capitalize on the strengths of the iPad" - Professor Sue Fletcher-Watson (University of Edinburgh). The challenge of finding an assistive speech app that works for your child or student can be overwhelming. Research has shown symbol-based augmentative and alternative communication (AAC) apps and devices can be expensive and difficult to use, and far too often younger, developmentally delayed, or intellectually challenged users struggle to find the words they need. AACORN AAC is the break-through that has everyone talking! 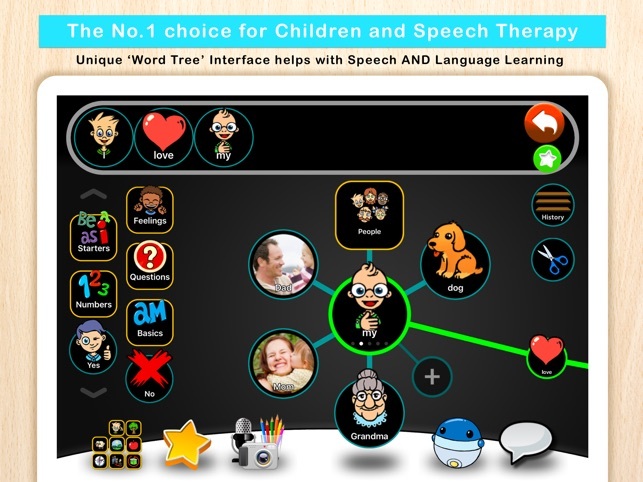 An innovative assistive speech AND language learning solution designed to be used by non-verbal children of all ages and abilities. aacorn is easier to use, more affordable, and goes beyond the ‘buttons that speak’ approach found in other apps, to also expand vocabulary and improve language comprehension! 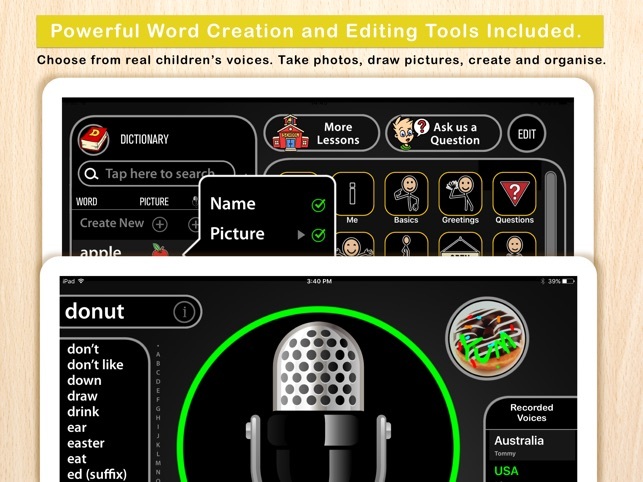 aacorn’s unique WORD TREE™ interface is the easiest to learn and use, because it was designed and made for children and the iPad - not ported from old style speech-generating devices for adults. Kids love aacorn’s bright friendly design, large buttons and intuitive layout! They often immediately understand how to use it, and find it a LOT faster and easier to communicate. Instead of hunting and pecking for single words, your child/student makes a word choice and branching pathways with smart suggestions for the next word in a sentence present themselves automatically! Over time through seeing these modelled your child associates meaning to word pairs. It works because it is a more natural approach that mirrors how we learn language, and removes much of the searching for words that can make traditional AAC apps and devices so frustrating.. The difference is amazing, with aacorn proven to help pre-literate children as young as 2yrs expand their vocabulary, and dramatically improve their language skills! * Research-based child-friendly design. Easiest to use - Guaranteed! * The exclusive Word Tree™ Interface - teaches language and grammar! * Unique Word Prediction - learns what YOUR child wants to say! aacorn is featured in Apple’s ‘Special Education’ and ‘Accessibility’ collections of recommended iPad apps that empower, and is widely acclaimed as the easiest to learn and use AAC app for children of all ages and abilities. i. aacorn supports the Apple Volume Purchase Program for schools and educational organizations purchasing multiple licenses. 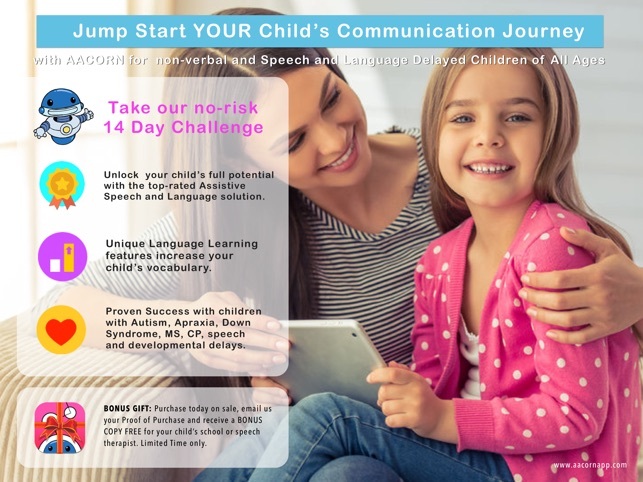 The top-rated augmentative and alternative communication (AAC) solution for non-verbal and speech delayed children is now even better! My son is 6 and basically nonverbal, what words he can say are approximations and very hard to understand. 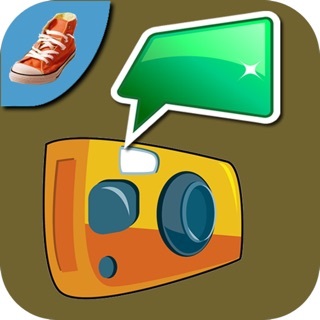 With this app he is able to speak in complete sentences and get out exactly what he wants. It was very easy for him to figure out how the organization works and the word trees that adapt to sentences that you normally use saves the aggravation of searching for words. There are many words to choose from, but adding more words and pictures is very simple. 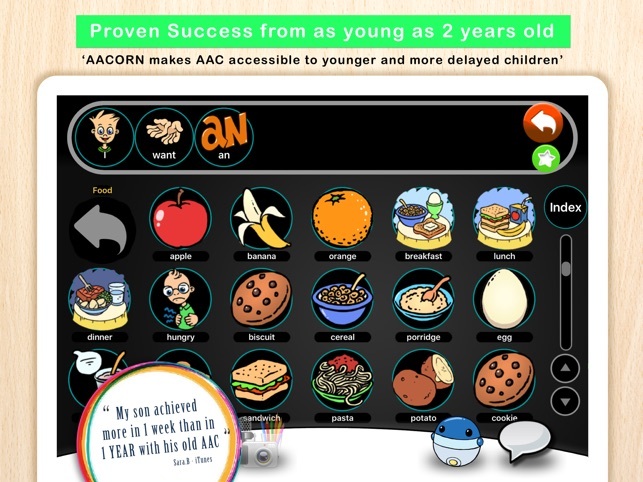 We have trailed a lot of aac apps and AACORN is the most successful with our son and very affordable. Thank you! My son has a vocabulary of about 15 words. With Aacorn he is not limited by the words he can say, now he has thousands at his fingertips. I love that I can customize his words, add photos of his own toys and family members. 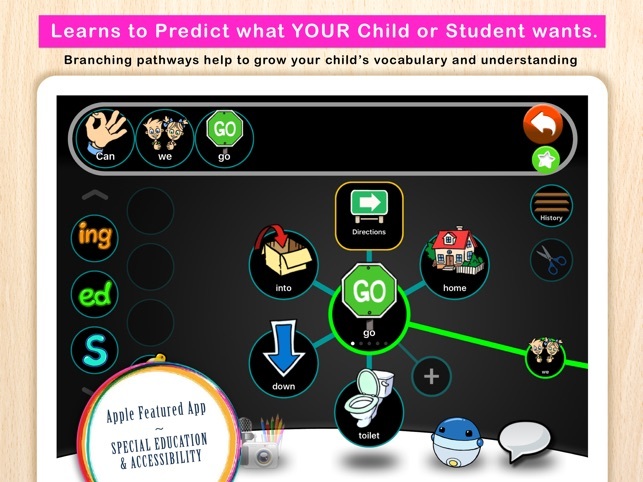 The word prediction tree makes finding the right word easier and faster. I wish I would have found this app earlier! Thank you Aacorn for giving Billy a voice. Great for growing with your child! Fantastic ap! Simple enough for my child to pick up at a very young age(love how the main screen isn't overwhelming with too much), but with enough meat so to speak that it's continued to grow with him as he's gotten older and more skilled with it. The company who makes it is wonderful about really listening to the community and striving to improve and already great product. Love!